Continuing a theme from previous articles – here and here. Never let price action take you somewhere your brain didn’t get to five minutes earlier. 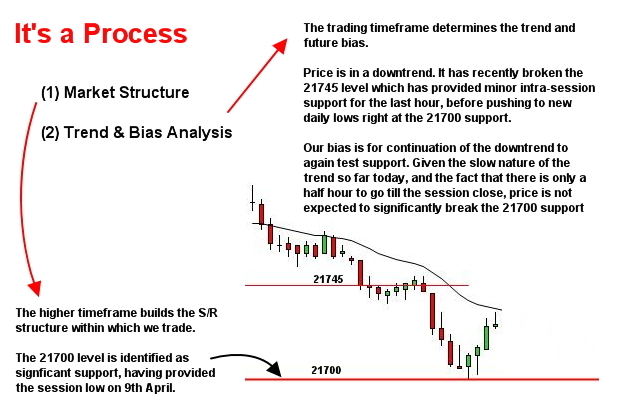 This is not just a concept to apply during the trading session. It also applies at session open. Start the session with some thought as to likely expectations for the type of environment and for likely initial price action sequences. This can be done for markets which have a defined pit-session opening time and for 24 hour markets at the time of major session openings (eg. UK, US forex session opening times). How is it likely to act? Why? Will that provide trade opportunity? What will it look like if my analysis is correct? What will price look like if I’m wrong? This is not prediction. This is simply forward planning… developing “IF-THEN” scenarios based upon your assessment of the likely future price action. 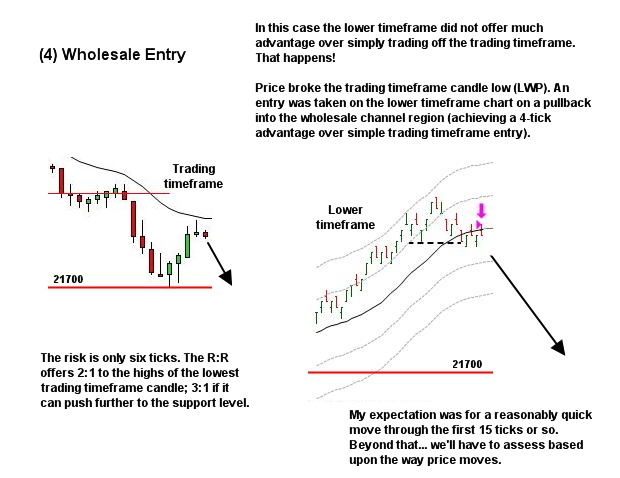 If your “read” of price movement proves correct, you will have trade opportunity. If it proves incorrect, you stand aside and reassess. This will ensure your actions in the market are pre-considered and your trades only occur when the market has conformed to your expectations. And you will be less likely to be caught in a trap through impulsive reaction to unexpected price movement. We saw an example of an opening IF-THEN scenario in last week’s article where we discussed an early-session trade opportunity in the SPI futures. This time from the Crude Oil market as it opened today, Monday 9th June 2014. 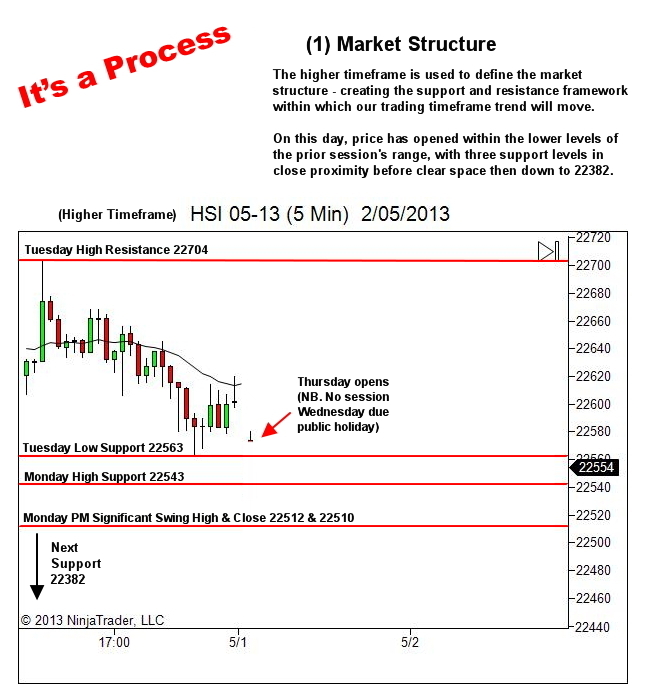 We’ll start with the Higher Timeframe in order to get a picture of the structure of the market. Avoid What is Strong – Strike at What is Weak! Trading is not about prediction. Instead we let the marketplace reveal it's plan and attack only when we see an advantage. We play the game on our terms, or not at all. Orderflow drives the market; orderflow that comes from the decisions and actions of all other market participants competing in the same arena as us. Let them drive price where they will; as determined by the collective sentiment of all who comprise the marketplace this day. We simply observe. And wait. Like the lion who waits patiently to attack the weakest in the herd, we avoid the market when it's strong and strike only when it shows it's weakness. It's also not about emotional reaction once we perceive weakness. Our awareness should always be ahead of price (see the "Projection Phase" in this article) maintaining IF-THEN scenarios for likely future price action and what it means to those who hold trading positions. Through maintaining these IF-THEN scenarios our reaction to the market movement will be preconsidered and decisive. We attack when we see weakness. We attack when we see someone trapped against the real bias of the market. We attack when our risk can be contained. We attack when we perceive potential opportunity greatly outweighs the risk. 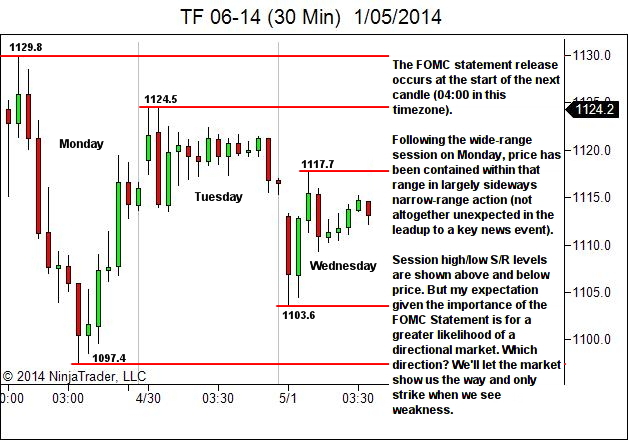 Let's start by looking at the structure of the E-mini Russell as at the release of the FOMC Statement on Wednesday. My higher timeframe is the 5 minute chart, but we'll commence first with a 30 minute chart in order to see a few days of data so that you have a wider perspective. You must aim to BUY at areas where you know others will buy after you, because their buying will create the net orderflow or bullish pressure to drive prices higher, allowing you opportunity to profit. 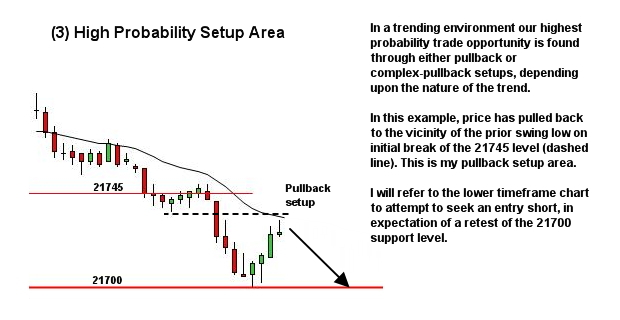 You must aim to SELL at areas where you know others will sell after you, because their selling will create the net orderflow or bearish pressure to drive prices lower, allowing you opportunity to profit. BUY because there are no more sellers. SELL because there are no more buyers. The following image was posted a few days ago on facebook and received more "likes" than any other YTC facebook post so far. So I thought we should examine the concept in a little more detail. The recent "It's a Process" visual articles have been very popular. So I thought I'd do a different one with a focus on a longer timeframe. Please note… I don't trade this timeframe. I trade lower timeframes for personality and lifestyle reasons. But there is no "best" timeframe. I know that many of you do trade higher timeframes such as hourly charts, 4-hourly charts or even daily charts. And that's fine. We all need to find our own niche. The important point though, is this simple fact… the process is the same. So which market should we look at? And which timeframe? Well perhaps we can do more of these covering different markets and timeframes. Let me know if you'd like more. But for today's effort I thought we'd start with the EUR/USD 4 hour timeframe. One of the most common themes I see in emails is a tendency for traders to focus too much on the individual trade. Every day… "I can't believe this trade lost. Can you tell me what I did wrong?" Never do I get the following… "Looking at my longer term stats as they relate to my last 20 trades, I see my win:loss size ratio down quite a bit compared to the average across all samples of 20 trades. I have assessed the following probable causes and solutions. I'd love to know your thoughts!" This is not a game of individual trades. This is a game of longer term results. We've touched on this theme a little in recent weeks. But the emails continue… so let's examine the idea one more time in a slightly different way. Several months ago I presented an article titled "How to Make a Strategy Your Own" which discussed the need to take your learning and development through a graduated process from post-session learning to simulation to live environment (minimum size) and then a gradual increase in risk. 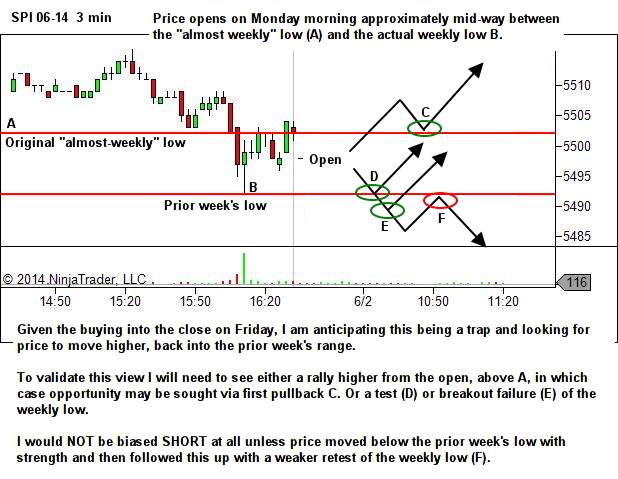 I presented an email and charts from a YTC Price Action Trader (YTC PAT) reader who was progressing well through this journey, in particular demonstrating his great work in post-session reviews. Today I'd like to present another email from a student of the YTC PAT which also demonstrates another aspect of making a strategy your own. You'll note that RV has made a number of significant changes to how I trade. This is EXACTLY what is necessary; and what I expect people to do. Not everyone seems to understand that. Making a strategy your own involves blending the new approach with your prior knowledge and skills, in order to create a new enhanced approach to trading the markets. This will necessitate a process of test and evaluation, along with a process of identifying challenges and implementing solutions to avoid them or overcome them. RV has done exactly that. And the end result is… well he's now trading for a living! That is so great. In particular you'll see this as it relates to timeframes, as RV has reduced my triple timeframe approach down to just one. Just because I use three timeframes does not mean that is the best way for you. One of the most common pieces of advice I give people who are overwhelmed, is to remove the lower timeframe and trade solely off the trading timeframe. And as to the higher timeframe, well I can personally operate quite comfortably without that. I think most traders once they get a little experience, can see the higher timeframe S/R within their trading timeframe chart. So if you prefer one timeframe only, I fully support that idea. Simplicity is always the best. Firstly forgive me for this rather long email but it's been 2 years since I first purchased your course on its launch and I thought I'd take this opportunity to update you on my progress. Due to my full-time job until recently I've been trading US stocks on weekly timeframe for obvious reasons with good results. Anywhoo I've now moved to full time trading mainly focusing on ES (Emini S&P) which trades at 9.30pm here in my timezone, which gives me plenty of time to groove my golf swing and spend quality time with my daughter. 1. Like you I love the CPB setup and every time I scratch a PB setup I'd be rubbing my hands for a CPB setup. In most cases I'd benefit from the trapped orderflow but sometimes the 2nd swing wouldn't quite make it to the prior swing low in an uptrend and vice versa, to get the trap setup, and price would move on without me. This led to 1st change – get on board with 2nd entry if a trap is not set. Al Brooks has mentioned this in his book. Alternatively leave the initial stop where it was, but I couldn't watch the drawdown. 2. Second change I had to make was getting rid of the lower timeframe chart as my attention was getting too focused on this timeframe and I was jumping in on every possible spring or upthrust setup leading to a string of losses. 3. Because I now had to focus on the trading timeframe, time based charts were getting me in too late into a trade so I replaced it with tick charts. So a 5min chart would be 1500 ticks and 60 mins would be around 15000 ticks. This worked like a charm as overnight data was compressed and S/R could be used next day. With a little experience the higher timeframe had to go too. My trading was getting better and why wouldn't it, I gave my brain very little to focus on. 4. My attention was now toward my exits and to try to balance my emotions of greed and fear. I changed my OSO orders to 3 targets and a stop. 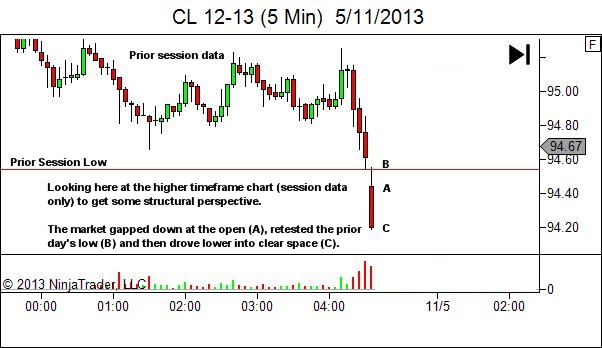 1st exit – 6 ticks for a scalp, stop moves to breakeven plus one automatically. 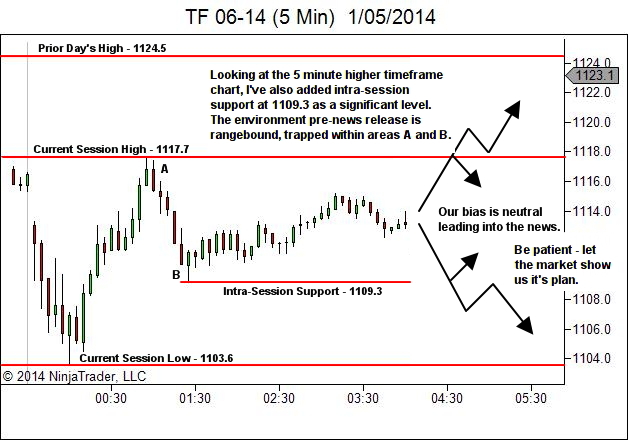 2nd exit – swing high/low and 3rd exit- runner with trailing stop. However market conditions dictate whether I'd take my runner off at the swing high too. This works incredibly well with my personality as I've fed all the monkeys on my shoulder. I was loving this adaptation to the beast, however the nature of the game is that sometimes the trapper gets trapped so I added failed PB, CPB, TST, BOF and BPB to my arsenal. They say its not a game of perfect – my response is – why not? If my search for perfection leads me to more time staring at charts then I've already been rewarded. As for the trading journal I've setup a workspace on my platform just for notes and trades taken or missed, so I just scroll back to review whenever I'm out of sync, and this happens every now and then. The review quickly jolts back my confidence and rhythm. Anywhoo this is becoming an essay. In closing I want you to know how grateful I am for your unselfish contribution to the trading community. God bless, and if you're ever in the country be sure to hook up for a drink and a game of golf. I'll re-phrase that – a game of golf followed by a few drinks. Wink! PS. I've attached 2 sessions of e-mini to highlight some of the changes. I don't often reverse a position when stopped out. Usually the failure of a trade in one direction does NOT automatically mean that the opposite direction offers good opportunity. 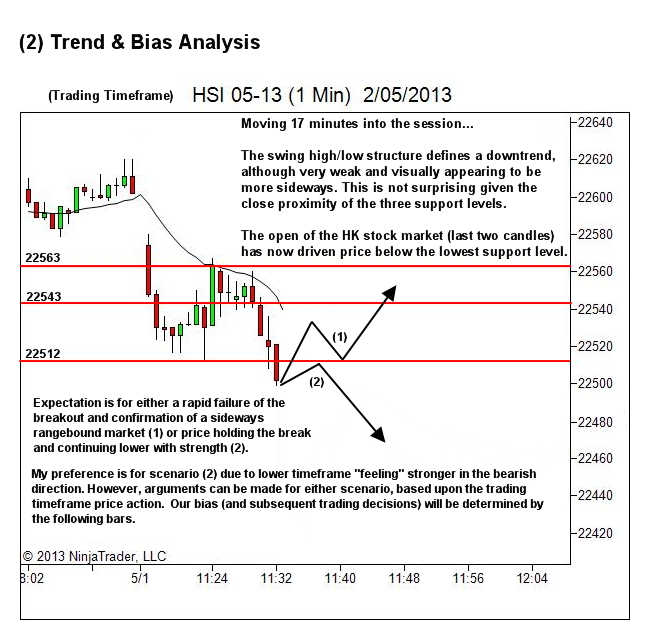 Most often when they do occur it's because I'm attempting a counter-trend trade and find myself caught in a trap. The stop and reverse allows me to minimise damage and possibly even profit on return to the with-trend direction. The opposite though, is rare. 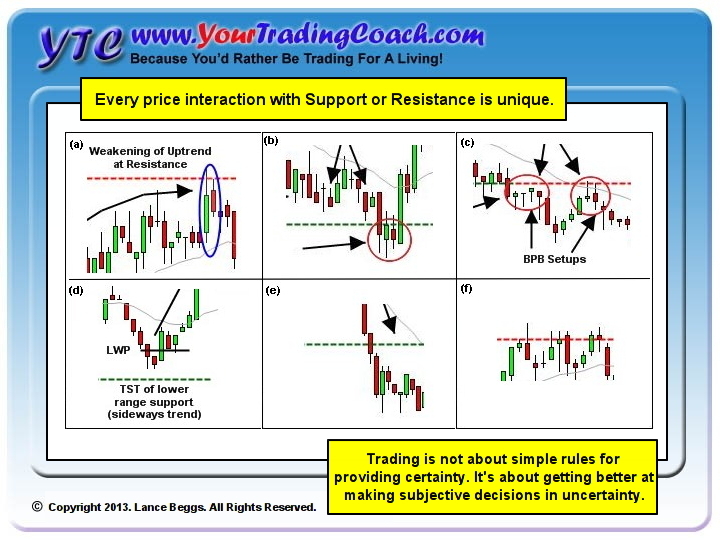 Reversing a with-trend trade into a counter-trend trade does not happen very often. And when it does, my expectation is NEVER for a complete trend reversal. Rather I'm looking to profit off a small reversion to the mean. And most often this will be done with a reduced position size. 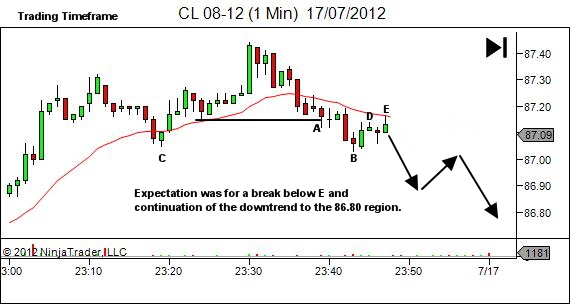 The trend was tentatively changed to downwards at A, with the change confirmed on continuation down to B. B's break of C was weak though, extending only two ticks, so entry on the first pullback to D was avoided in preference for a second chance entry on the failure of bar E. Entry was sought intra-candle on the lower timeframe in expectation of a continuation of the downtrend. Part one would target just inside the prior low at B with part two running to the 86.80 region. Standard YTC Price Action Trader stuff, but on a lower timeframe.